President Hassan Rouhani faced accusations of a failed nuclear deal which has not benefitted the Iranian people, during the final televised debate with his rivals before the country’s presidential election next week. The vote is being seen as largely a referendum on reformer Mr Rouhani’s outreach to the rest of the world following a landmark accord with global powers, which ended sanctions but bitterly divided the country. The president is believed to be the frontrunner in the May 19 election but the failure of the 2015 accord to bring economic gains for the public has brought an opening that his main competitors, powerful conservative cleric Ebrahim Raisi and hardline Tehran mayor Mohammad Bagher Qalibaf, have sought to exploit. In the most heated of the three debates, his opponents focused on his inability to deliver the jobs and growth he said would follow the unlocking of billions of dollars worth of assets. 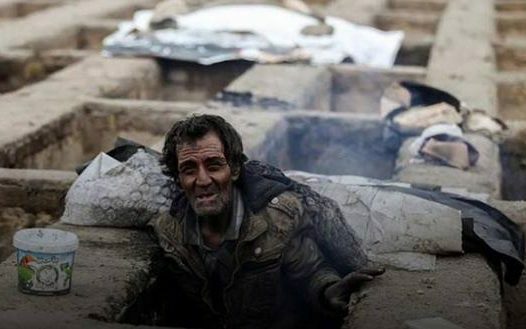 The economic crisis can be seen in pictures of homeless people sleeping in graves outside of the capital Tehran, images that shocked the nation and Mr Rouhani himself. The poor, both young and old, are forced to search the rubbish for food or cleaning car windows for loose change. The president found himself heckled and his vehicle beaten by angry miners last week as he visited the site of a coal mine disaster that killed at least 42 people, as they used the opportunity to complain about lay-offs and late payments from the state. Mr Rouhani, who is seeking a second four-year term, has promised during his campaign to normalise relations with the west, greater foreign investments and a revival of tourism. “I’m ready to, over the next four years, lift the rest of the sanctions against the Iranian nation, like the nuclear sanctions that I lifted over the past four years, with strength,” he said in Friday’s debate. But his main rival, Mr Raisi, said it would do little to help, and that the president had bet too strongly on rapprochement with the West and on foreign investment. Mr Raisi has campaigned on job creation and bigger cash handouts for the poor, but he has remained vague on other issues, including foreign policy. He has however committed to uphold the nuclear accord despite reservations. Mr Raisi, seen by some as a protégé of Supreme Leader Ayatollah Ali Khamenei, is the president’s main challenger but is still a very distant second with less than a week to go. Historically, the more Iranians who cast ballots the greater the chance a reformist or a moderate like incumbent President Rouhani will be elected. However, Mr Rouhani’s bid for another four-year term comes amid widespread apathy among younger voters. If no candidate wins 50 per cent of the vote, there will be a run-off between the top two one week later. Previous articleTrump’s Policy in the Middle East: Gunboats at dawn?